Buttermere is a small village situated on the B5289 nestled between Buttermere Lake and Crummock Water in a very stunning area of the Allerdale district of Cumbria. The village and the two lakes are surrounded by fells such as the High Stile range to the south-west, Robinson to the north-east, Fleetwith Pike and Haystacks to the south-east and Grasmoor to the north-west. Alfred Wainwright’s ashes were scattered at Innominate Tarn on Haystacks. Although small this quaint village is popular with tourists and houses two cafes both selling local products with Syke Farm specialising in ice-cream made from the milk from the farms herd of Ayrshire cattle and also has two pubs, The Bridge Hotel and The Fish Inn both of which have accommodation. The road on which Buttermere lies heads northwards along the valley of the River Cocker to Cockermouth and southwards to Borrowdale and Keswick via Honister Pass. The little minor road heading eastwards crossing Newlands Pass into the Newlands Valley is a short cut to Keswick. The Bridge Hotel stands on a site dating back to the 11th century where an armoury and a bakery stood in connection with the Water Mill that Earl Boether built higher up stream. The mill worked continually for seven centuries until around 1734 when the buildings were sold to the church. The curate, Reverend Robert Walker, obtained a beer licence and the buildings became the Bridge Inn. It was sold to Jonathan Thomas Sleap in 1837 who rebuilt the inn using stone from the old water mill and changed the name to ‘Victoria’ after a visit by Her Majesty in 1850. Mrs H Cooper inherited the property in 1861 adding the bay windows. In 1920 the author Nicholas Size extended and improved the inn then after his death the new owners changed the name to The Bridge. The present owners, the McGuire’s, bought the hotel in 1978. Buttermere Lake owned by the National Trust is a beautiful lake from which Buttermere village takes its name. It is about 1¼ miles long by about ¼ of a mile wide and 75 feet deep lying at the head of the valley of the River Cocker. Buttermere village stands at the north western end of the lake and beyond this lies the just as beautiful Crummock Water and beyond that, to the north, there is another lake called Loweswater both of which are also owned by the National trust. Crummock Water is about 2½ miles long by ¾ of a mile wide and 140 feet deep, has six small islands and is dominated by the hill of Mellbreak which runs the full length of the lake on its western side. The River Cocker flows northwards from Crummock Water into the Lorton Vale. There is a footpath around both lakes. Rannerdale Knotts at 355 metres maybe one of the smaller Cumbrian fells but it certainly has a good stiff climb to the top. It overlooks the southern end of Crummock Water and is surrounded by the much higher fells of Grasmoor, Whiteless Pike and across Crummock Water by Mellbreak, Red Pike, High Stile, High Crag and Haystacks. The south-western side of Rannerdale Knotts is bounded first by Mill Beck, running through Buttermere village, and then by Crummock Water. The north-eastern side falls to Squat Beck which feeds Rannerdale Beck. The long range views from the summit are limited by the circle of higher fells but the view across Buttermere to Great Gable in the distance is superb also Loweswater can be seen across Crummock Water. In the late 11th century or early 12th century it is said that Rannerdale was the site of a battle between the native Cumbrians and Norsemen and the invading Normans. The battle is thought to have taken place in the side valley of Rannerdale, which runs east from the summit of Rannerdale Knotts, west of Whiteless Pike and south of Grasmoor fell. The battle ground, in which the Normans were ambushed and defeated by the Cumbrians and the Norsemen, is now an area where bluebells grow in abundance during April and May. According to local folklore the bluebells are said to have sprung from the spilt blood of the slain Norman warriors. The bluebells in their glory is well worth a visit and can be access via a path from the car park just below Rannerdale Knotts. The area is owned and maintained by the National Trust. From the car park at the side of Lanthwaite Green Farm we turn right and walk on the grassy path at the side of the road with Crummock Water on our right. After about a mile we come to two car parks close together. We now take the road, passing Rannerdale Farm and holiday accommodation, to the next car park at Hause Point which juts out towards Crummock Water. We now take the path, which can be seen clearly in front, uphill. We keep following the path steeply uphill bearing left to a large flat grassy area. We take the path turning left uphill with the gorse bushes on our right to a cairn. At the cairn we turn right and keep heading very steeply up hill on the stone steps. At the top of the steps we come to a grassy area with a large rock formation in front of us we bear to the right of the large rock following the path uphill to the summit of Rannerdale Knotts. We keep following the path up and down along the tops. When the path splits you can head straight forwards and turn left or take the left hand path for a short cut to the track down below. On reaching the track down below we turn left and keep following the track. Soon we follow Squat Beck and a wall on our right to cross over a footbridge which takes us into the Bluebells. We now just follow the path through the Bluebells until we go through a gate and then head forwards downhill to the road. We now retrace our steps back to Lanthwaite Green Farm car park. This is a moderate walk on minor road, good paths and tracks with a stiff incline up to the summit of Rannerdale Knotts. There is a short section of steep stone steps to ascend. Elevation: Approx lowest point 105.3m (345.5ft) approx highest point 350m (1148ft). Approx 5.2 miles allow 2¼ to 3 hours using OS Explorer Map OL4, The English Lakes North-western area. Start point: Free car park next Lanthwaite Green Farm. Rannerdale is near Buttermere in the Lake District, Cumbria. From the A66 take the B5292 Braithwaite. On entering Braithwaite take the first left then bear left and follow this road and the signs for Buttermere. On reaching the t-junction at Buttermere turn right through the village and follow this road the B5289 to the far end of Crummock Water and the car park is on the left next to Lanthwaite Green Farm. Parking: There are three free car parks and a lay-by on the B5289 alongside Crummock Water. There are no public toilets or refreshments the nearest facilities are at Buttermere and Keswick. 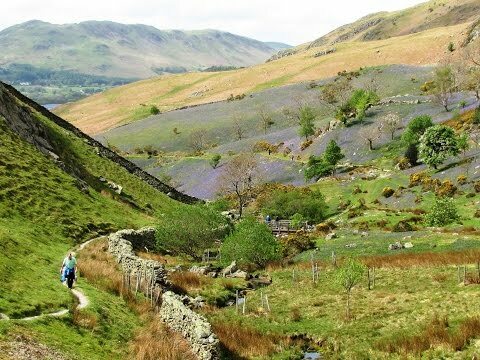 What’s up,I check your blog named “Rannerdale Knotts and the Bluebells round | Lake District (Cumbria) Walks | Walking Guide” regularly.Your story-telling style is witty, keep up the good work! And you can look our website about مهرجانات 2017.